A retrofit patient transfer system has won the India James Dyson award on Thursday. The product MAATTAM is designed by IIT Kanpur student Asish Mohandas as a part of his final year degree project. After surveying amongst doctors, nurses and ward boys, Mohandas found majority of hospitals and clinics in India does not have efficient stretcher that transfers patient without any pain. 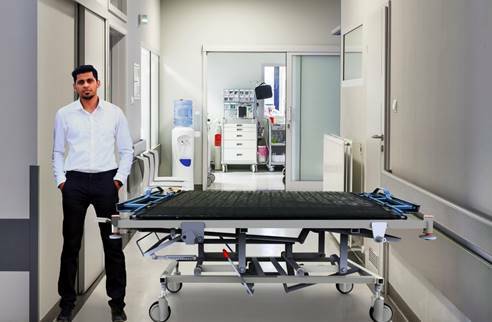 “I wanted to design a simple, affordable and retrofit solution which would most appropriately solve the problem of patient transfer in hospitals and create a better experience, every time the patient is getting transferred. It will also ensure evading the problem of spine disorders while shifting,” said Asish Mohandas. The mechanism works similar to a treadmill having a moving platform with a wide conveyor fabric belt and rollers on either ends. MAATTAM being a retrofit can be put on top of any wheeled stretcher with flat top surface and height adjustment facility, converting it into a transfer stretcher. To check the functionality, a 1:2 scale prototype was fabricated and was tested by transferring a mannequin and was later tested with a human body, by transferring the child from a rest unit to the stretcher. This innovation will now be running for the International Winner Award and prize money of £30000. The international winner and finalists will be announced on October 26, 2017. James Dyson Award operates in 23 countries – this year the hunt extended to India for the first time. The James Dyson Award looks for remarkable yet simple designs with the potential to have a huge impact on society.